You probably know the classic symptoms of depression: low mood, excessive crying, loss of interest in things you love, and withdrawing from others, for example. 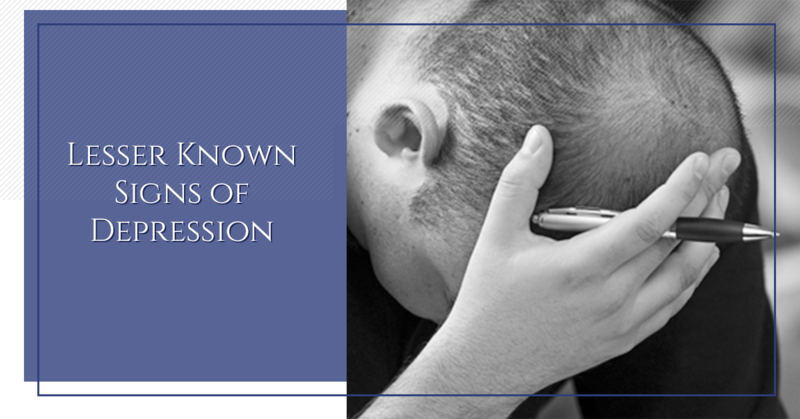 However, there are many, lesser known signs of depression that you might overlook. It’s important to understand the different ways that depression manifests so that if you or a loved one shows signs of depression, you can get help promptly. In this blog, we will go over some of the lesser known signs of depression. Does it seem like anything can set you off recently? Do you feel like you are in a perpetual state of grumpiness? Are you getting into arguments more frequently? Many people don’t realize that depression doesn’t just show up as sadness; it often involves a lot of anger. This is particularly true of men who, due to social mores, are more comfortable feeling mad than sad. Many people think of suicidal thoughts as creating a plan to kill themselves, but in reality, there are two types of suicidal thoughts: active and passive. Active suicidal thoughts center around thinking about killing yourself, whether you plan the act or not. When you have active suicidal thoughts and a plan, it’s imperative that you seek emergency medical attention immediately. Passive suicidal thoughts, on the other hand, are not marked by a desire to kill one’s self, but a desire to die. For example, someone with passive suicidal thoughts might wish that they won’t wake up in the morning. Whereas someone with passive suicidal thoughts might hope that they accidentally get hit by a bus, an actively suicidal person would plan to jump in front of it. Because depression is a mental health disorder, many people don’t make the connection to physical pain. However, depression and pain are actually quite interrelated. In fact, they share many of the same neurotransmitters and neurological pathways. Around three-quarters of people with depression experience chronic pain. People with depression often experience back and neck pain, as well as head and stomach aches. When you have a bad day at work, you might have a drink in the evening to take the edge off. But recently, you have been having closer to three drinks, or maybe turning to other drugs to cope. Unfortunately, while alcohol may temporarily make you feel better, ironically, it is a depressant, meaning that it ultimately only serves to worsen your depression. Watch for increased drinking and drug use as a sign of depression. According to a Columbia University research study, we make around 70 decisions every day. Should we hit the snooze button or get out of bed? Take a shower in the morning or wait till the evening? Eat cereal or eggs? Normally, these decisions happen almost unconsciously, but when you’re depressed, it takes a toll on your cognitive abilities. Suddenly, even the smallest of decisions feel like they bear too much weight to make. At New Transitions Counseling Center, we have extensive experience in providing depression therapy. We understand that your symptoms might be confusing to you, but we would love to help you navigate them so you can live your best life. Contact us today for cognitive behavioral therapy in Palatine.